That’s it – Xerocon is officially over for another year! And among the many exciting announcements, including a few of our own, there was one clear message: be more human. That’s because this year’s Xerocon was all about finding ways to use new tools to be a more attentive, more effective advisor to your clients. In the ‘What’s your client app stack?’ breakout session, our partner Sharon Pocock, of Kinder Pocock, stressed the importance of getting to know apps inside out before recommending them to a client. That way, you can ensure that your client will both have a better experience of the app, and feel confident in asking you for support. Ok we’re a bit biased, but our favourite breakout session was our talk, Driving Value With Data: How To Crack the Bookkeeping Circle, hosted by our Director, Alexis Prenn, and our Customer Experience Manager, Steven Lucas. Alexis discussed the concept of the bookkeeping circle: a circle which revolves between getting data and adding value to that data. As the ‘getting data’ stage of this cycle gets easier and faster with automated processes and AI technology, so the ‘adding value’ stage becomes more significant. Sales Invoice Extraction, which comes after much demand from a number of our partners. Fetch, which syncs with your clients suppliers and fetches invoices automatically. Sweep, which identifies receipts and invoices in your email inbox and automatically posts them to Receipt Bank. It’s safe to say everyone was pretty excited. We’ve got so many more great features coming soon, so watch this space! It was also a great honour to be announced as a launch partner of Xero HQ, which was officially introduced at Xerocon this year. For more on this exciting partnership, check out the blog post. 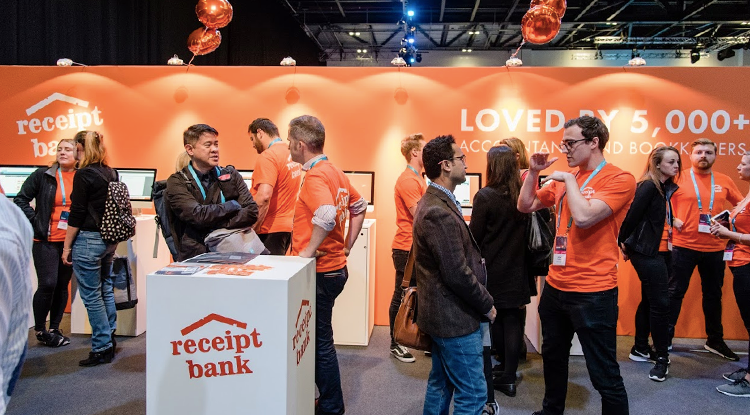 Of course Xerocon wouldn’t be Xerocon without the awards ceremony, and this year every single winner in the accounting and bookkeeping categories was one of our partners! We couldn’t be prouder that the best in field are all Receipt Bank partners! Our favourite part of any event is chatting to our partners and getting to know them a bit better. As we caught up with our partners, we asked them to sum up Xerocon 2017 in a sentence. “It’s inspirational to see the community grow year on year,” added Alastair Towler of Plummer Parsons. “Utterly amazing and fully immersive,” giggled Frankie Sunderlands of The Wow Company when she stopped by the stand. The keynote speech by Tim Leberecht perfectly encapsulated the message of this year’s Xerocon: running a beautiful business in the age of machines. His engrossing speech covered the ways in which we can try to be more human in running our businesses, especially as machines take charge of the menial processes. He highlighted a study by Forrester which found that emotion is the number one factor in determining customer loyalty and advocacy. That’s why it’s so important to go beyond the minimum, since tasks that might at first seem unnecessary could go a long way towards creating truly personal relationships with your clients.